Phil Handy was so annoyed by trash-talking text messages from his Bay Area friends about the Cleveland Cavaliers getting drummed by 15 points in the NBA Finals opener that he turned off his cellphone. And then the Cavs were humiliated further by his hometown Golden State Warriors 110-77 in Game 2. The problem? Handy is Cleveland’s assistant and player development coach and it suddenly appeared that the Warriors could potentially sweep LeBron James and the Cavaliers. Handy respects head coach Tyronn Lue and stays in his lane as a Cavaliers’ assistant coach. But, after the Cavaliers looked overmatched, displaying little fight in their Game 2 beating, an emotional, almost-in-tears Handy asked and received permission from Lue to call out the team. “We looked like a deer in headlights,” Handy told The Undefeated. “I was like, ‘Man, T-Lue, I’m not trying to step on your toes, but I got something to say, man.’ I didn’t go at nobody, directly. I was talking to all of them. The Cavaliers appeared to have heeded Handy’s words as they came ready to play in Game 3, jumping to a 9-0 lead. After the concerned Warriors called a timeout, James was unusually passionate and excited as the Quicken Loans Arena crowd roared with renewed hope. The Cavaliers went on to dominate the Warriors 120-90 to trim their Finals series deficit to 2-1 and snap a seven-game losing streak against Golden State. While big games by James, Kyrie Irving and J.R. Smith had a lot to do with it, Handy got some credit for lighting the Cavaliers’ flame. Handy’s hoop passion actually dates to his days growing up a big Warriors fan in a now quickly gentrifying West Oakland, California, about a 10-minute drive from Oracle Arena. Handy, 44, was the youngest of six boys and one daughter of C.L. and Earlean Handy. He fell in love with basketball and the Warriors as a child. Phil Smith, Sleepy Floyd, “Run TMC” (Tim Hardaway, Mitch Richmond and Chris Mullin) and Sarunas Marciulionis were his favorite Warriors. Growing up, Handy played against future pros such as Hall of Famers Gary Payton and Jason Kidd, Brian Shaw and Lamond Murray. Handy experienced his share of drama growing up in West Oakland: home invasions, gunshots heard in the distance, watching neighbors get run over by cars that didn’t stop. His parents, however, made a family-changing decision by moving to the safer, suburban Union City, California, when he was 11. Kevin Love, No. 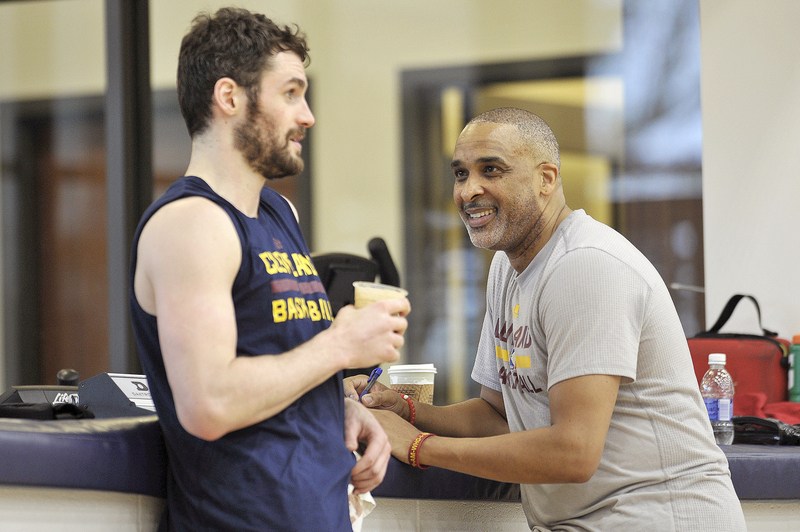 0, and Phil Handy of the Cleveland Cavaliers talk during an all access practice at the Cleveland Clinic Courts on April 28, 2016, in Independence, Ohio. “If we stayed in West Oakland, I don’t know if I would be here to talk about it right now,” Handy said. After he went undrafted as a scholarship ballplayer out of the University of Hawaii, the 6-foot-5 combo guard had short stints with the Warriors and Portland Trail Blazers. He completed his pro basketball career overseas, where he played in the United Kingdom, Australia and Israel. Next, he became a basketball trainer, working out with players such as current Charlotte Hornets guard Jeremy Lin. Handy got back into the NBA as a player development coach with the Los Angeles Lakers from 2011-13. He quickly developed a strong relationship with five-time NBA champion Kobe Bryant before joining the Cavaliers in 2013. Soon, Handy connected Bryant with Irving through a dinner in Los Angeles last season. Irving adopted the legend Bryant’s workout through the two players’ connection and Handy’s guidance. Handy sent Irving a motivational text message on the eve before he dropped 30 points and eight assists in Game 3. “Coach Handy has done an unbelievable job,” Irving said. “He’s kind of the one who introduced the relationship and mentorship that I have with Kobe. And in terms of working out late nights, doing whatever it takes to win, learning how to lead, understanding the nuances of the game and understanding what it takes to be a great player in this league, [Handy’s] really kind of put down the foundation and steps. Handy is likely done giving pep speeches to the Cavs, but his faith is now strong that the franchise’s first NBA championship can be won by his beloved boys.